Dr. Carlos Jimenez Härtel is Chairman of the Supervisory Board of the GE Power AG. He’s also an independent strategy advisor to private-equity companies and holds a number of board assignments with universities and international organizations. His operational career in industry spans about two decades in a variety of senior leadership roles, most recently as CTO & Chief Innovation Officer for GE Europe and previously as President & CEO for GE Germany. In addition, Carlos Härtel served as Director of GE’s European Research Center in Garching near Munich since 2007. At the center, he was overseeing R&D projects and university collaborations across a broad range of domains from renewable energy, power electronics and aircraft propulsion systems to diagnostic imaging for medical applications, cyber-physical systems, manufacturing technologies for carbon composites, and metal 3D printing. Carlos Härtel has extensive experience in industrial research & development, management of technology transfer and innovation, and the assessment of potential and market readiness of advanced technologies. He studied Aerospace Engineering at RWTH Aachen and TU Munich where he also received his doctorate. 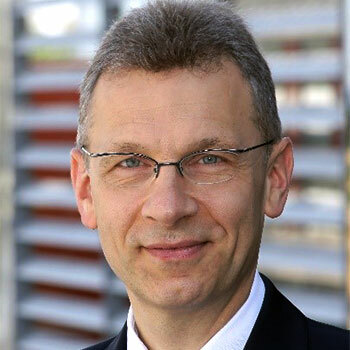 In addition, he spent several years in research at the German Aerospace Center (DLR) and at ETH Zurich, where he qualified as a Senior Lecturer (Habilitation) in 1999. Carlos Härtel is past President of the European Industrial Research Management Association (EIRMA). Mastering development& innovation: process, LCM & PPM, AI, VR & ML, human centricity & design thinking. BLOCK: DIGITAL & TECHNOLOGICAL TRANSFORMATION. CASE STUDY: The Digital Industrial Transformation – from productivity to customer value.